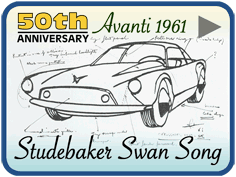 2011 marked the 50th anniversary of events that led up to the production model Studebaker Avanti. The Studebaker board had recently appointed Sherwood H. Egbert as the new company president. Sales of the phenomenally successful Lark were plummetting after introduction of the Chevrolet Corvair, Ford Falcon, and Chrysler Valiant. Egbert's strategy for saving Studebaker was a radical one: introduce a sensationally styled and cleverly engineered sportscar that would bring buyers into showrooms where they would rediscover the virtues of the Lark and other Studebaker models. 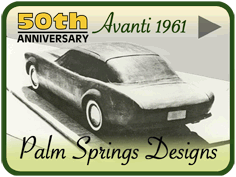 During 1961 three separate but related events led to the first production Avantis. First, Egbert sold his inspiration to the Studebaker board; second, Raymond Loewy and Associates accepted the assignment to design an all new sportscar for them; and third, a talented design team was recruited and lodged in Palm Springs, California to conceptualize, sketch, and model the new design in clay. This design was submitted to the Studebaker board members who responded with a standing ovation. 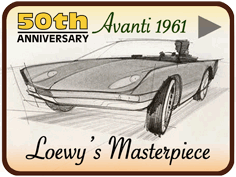 The Avanti was a star almost from the moment of its inception. Swan Song - The Studebaker Automotive Division was struggling to survive within the larger Studebaker Corporation when president, Sherwood Egbert proposed a new strategy: build a sensationally styled sportscar to shake up the competition and bring buyers back into company showrooms. Masterpiece - Renowned for former automotive styling triumphs, including memorable designs for past Studebakers, Raymond Loewy's industrial design firm was chosen for the venture. Loewy had been busy working for European car builders for several years on several high profile sportscars. Palm Springs - Loewy selected three designers to work with him on the project which produced successful designs in only a few weeks. The members of the team worked and lived in a new two room house built on the desert landscape of Palm Springs only minutes from the now famous Loewy House.